In the chilly waters off the Scottish coast, Andrew MacIntyre gets up close to some giant beasties on one of the ultimate underwater wildlife expeditions. In the open sea, waves lap at eye level making it difficult to focus. Between slaps of water I see a giant black dorsal fin cutting through the water directly towards me. The unforgettable shape, ingrained in my mind thanks to countless movies, triggers a primeval instinct to get out of there and fast. My heart is pounding so hard it threatens to burst out of my chest, but then I take a deep breath. This is no predator. Growing to more than 10 metres long and weighing as much as a bus, basking sharks still have the capacity to inspire terror as they swim these temperate waters scooping up plankton with their vast mouths. But, really, these are the gentle giants of the ocean. Plankton hoover: the whale shark’s metre-wide mouth is an eating machine. Although there are a number of whale- and dolphin-watching operators in the region there is only one dedicated shark-swimming operator. Basking Shark Scotland is located in Oban, a quaint fishing town with the obligatory distillery, ruined castle and friendly pubs. In the summer season the town bustles with tourists delighting in its coastal charm, but I’m here for what lies offshore. Accompanied by just 10 other excited travellers, I’m met by the operation’s enthusiastic owner, Shane Wasik. Once aboard the high-powered cabin boat we’re issued seats and lifejackets and briefed on the action-packed itinerary. Taking off, we cruise through Sound of Mull, passing Rubha nan Gall lighthouse, built by Robert Louis Stevenson’s father, Thomas, and a Clan Maclean castle perched on the cliff. It’s a typical Scottish coastal scene: high mountains on either side of the sound, porpoises cresting around the boat, seals basking on rocky skerries and gulls soaring overhead. After an hour or so, a shout goes up from the viewing platform – a white-tailed sea eagle has been spotted up ahead. Eyeing us from an elevated cliff-top ledge, it soon returns its attention to the surrounds, scanning the area searching for its next meal. Suddenly, it spreads its wings and we see the giant bird in all its glory as it glides off into the forest. Shortly after we make a stop in the village of Tobermory, made famous locally by the kids TV series Balamory. Its waterfront is dominated by pastel- coloured buildings hosting a variety of highland craft shops, B&Bs, pubs, restaurants and a large distillery – in fact, everything you could want in a main street. But we’re here only briefly since there are bigger fish to fry, so to speak. A great beast swims near. The geological formations at Fingal’s Cave. We leave the sheltered waters of the Sound of Mull and skipper Cameron points the bow towards a distant island on the horizon. Shane gives us a briefing on what we should be looking for – telltale triangular dorsal fins on the surface and sometimes the tip of the tail or nose. As the sharks feed at the surface, we only have to snorkel to see them. It’s really no different to exploring a coral reef, except it’s a bit cooler in the water and the wetsuit is a little thicker – seven millimetres to be precise, with matching boots, gloves and hoods. The boat pulls in among a group of idyllic uninhabited islands. The sea’s sandy bottom allows the sun to turn the water a brilliant emerald green. With little human influence, it’s amazingly clear and unpolluted. As we get our gear on, it takes everyone on the boat a moment to notice the rather large welcoming party. Our anchoring spot is a seal colony and more than 20 of them have surrounded the boat. I flop over the side and into the water, the frigid shock making me take a deep breath, but I soon warm up and any thoughts of the cold disappear. As we fin towards a white sand beach, the seals flit back and forward. Their large puppy-dog eyes watch our every move and their barrel rolls and somersaults easily outmanoeuvre our clumsy swimming. We spend a good hour – it seems like five minutes – with the seals before it’s time to move on. Back on board, home-baked treats and hot chocolate are handed around as we prepare for shark watch. 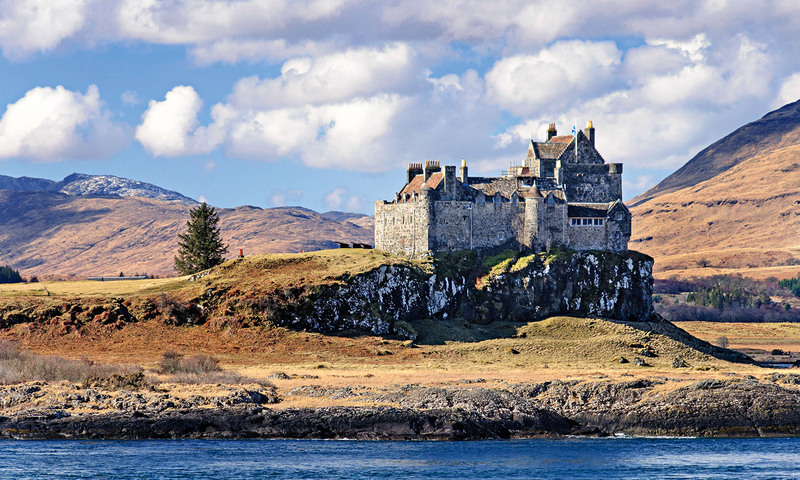 Duart Castle on the Isle of Mull is the ancestral home of Clan Maclean. Binoculars in hand, Shane keeps watch at the stern as we all peer out the windows. Cruising down the coast again, the boat pulls in to little bays and inlets hoping for signs of our monster targets. As we’re getting comfortable in our seats, the shout goes up. “Shark!” Sure enough, a hundred metres off the bow is the unmistakable shape of a dorsal fin. “You’re gonna need a bigger boat,” someone jokes. Smiling, Shane notes the shark is probably between seven- and eight-metres long, and since the boat is just 11 metres in length, they may be right. As the dorsal fin gets closer and closer, the butterflies in my stomach begin performing acrobatics. This is a very big fish and, due to the plankton bloom, underwater visibility is limited. Suddenly, its gigantic mouth appears, and it looks as though at least two of us would fit in there. The shark moves slowly but purposefully in a rhythmic motion as it glides through the water. Closer and closer it comes, and I feel as though I’m going to be scooped up like Jonah until, at the last moment, it sweeps past, literally within touching distance. I freeze as the grey-brown mass of mouth, body and fins passes. Its full eight-metre length seems to go on forever; then, as quickly as it appeared, the shark is gone. But it’s an experience I’ll remember forever. Qatar airways flies from Melbourne to Edinburgh with one stop in Doha. Head to Oban from Edinburgh by train. the journey takes about four hours and 15 minutes and, booked in advance, costs about US$25 each way. Oban has plenty of B&B options, but the Ranald Hotel is a more modern option. the 17 rooms range in size from compact to Grand Plus. Doubles from about US$105 a night. 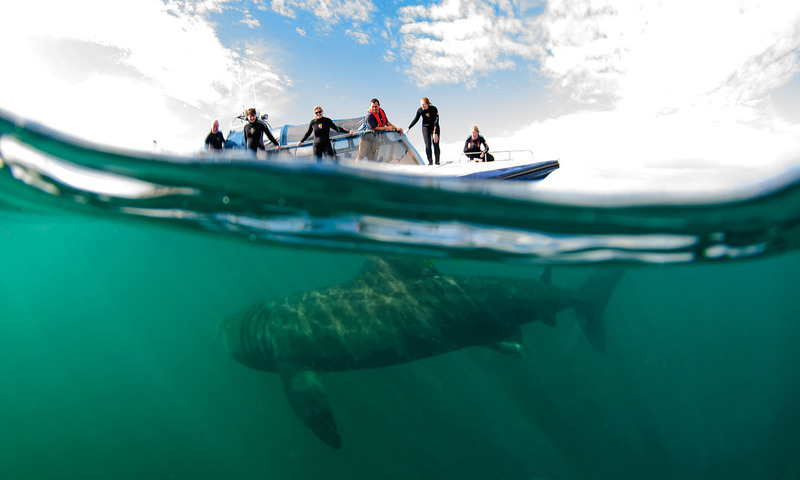 Basking shark Scotland also offers comfortable share accommodation at Coll Bunkhouse during its multi-day tours.